On our drive home from down south recently the crazy weather had us staying overnight in Rockhampton. The place we stayed the Coffee House was the obvious choice, 1) Coffee, 2) Spa bath rooms 3) room service. Coffee was ok (just not my brand), food was good and spa despite an over application of bubbles by she who will remain nameless was excellent. 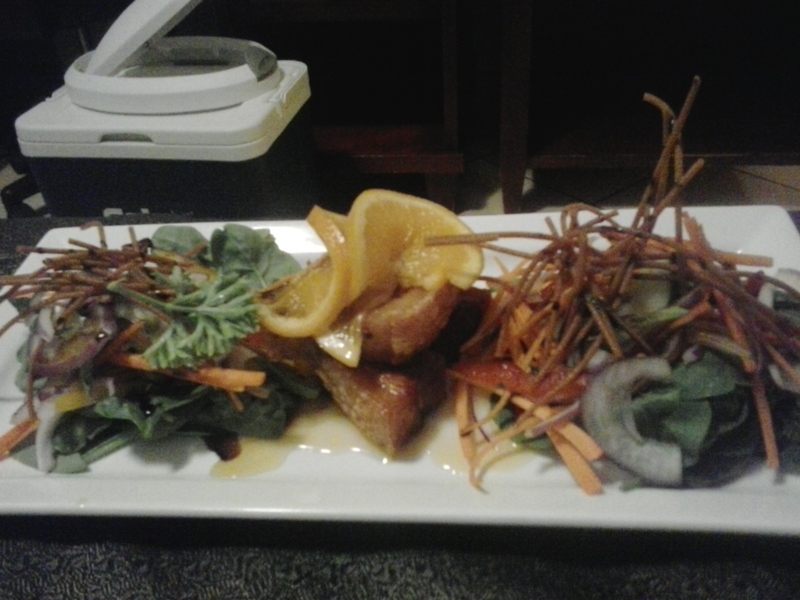 I had Orange Glazed Pork Belly with crispy noodle salad and Paula had Smoked salmon and Creme Fraiche Corn Fritters. The meals were good for the price which was very reasonable. Meals and a really nice spa room for under $200 bucks, bargain. 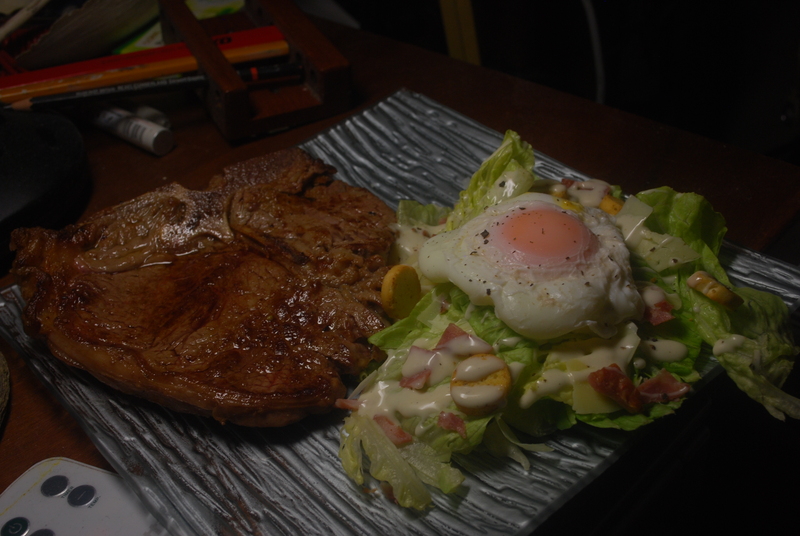 This is one of those last minute what ever you have salads. Paula decided to make ‘Her’ Devils On Horseback so i thought I would make the salad to balance the sweet meaty dateyness of the DOHB. The DOHB are fresh dates stuffed with spiced pear paste and feta cheese and wrapped in our butchers award winning bacon (best in country). 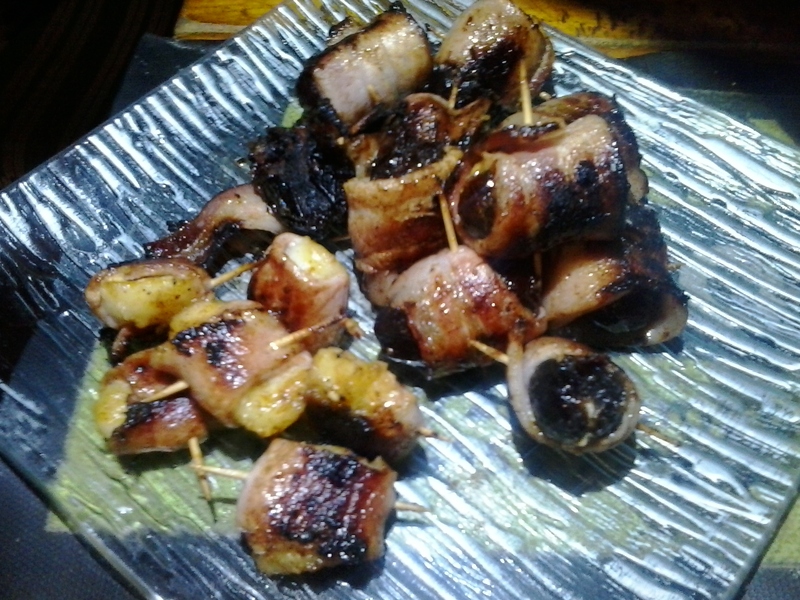 There are also pieces of banana wrapped in bacon. 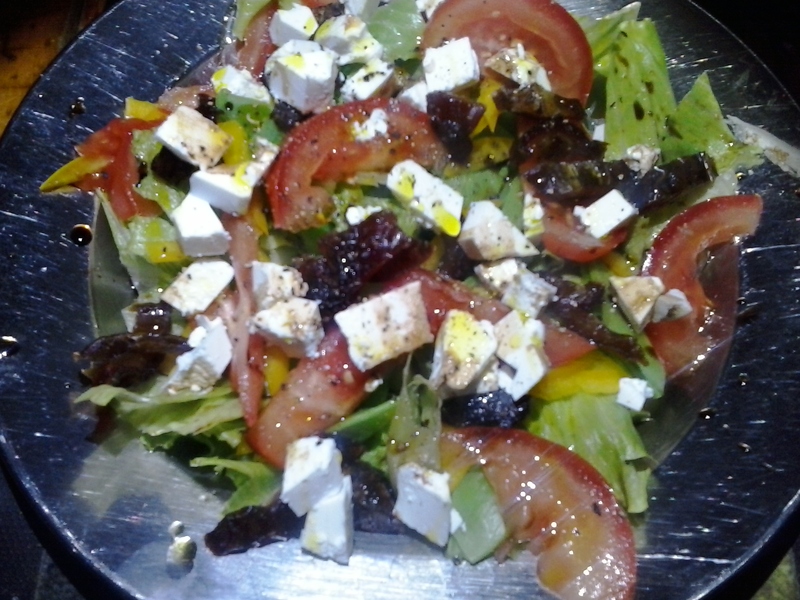 The salad is romain lettuce, tomato, feta, date, snowpea and yellow capsicum. The dressing is just avocado oil and balsamic vinegar. Not being a big fan of most types of takeaway but still having the issue of being time poor with work and the like I try to find better options than sad and unhealthy takeaway. When we house sat in another part of town recently and were pressed for time one night we decided to get takeaway. We went to a fairly large shopping complex that had a supermarket and about six fast food options. After a quick walk around of the outlets we soon found them all lacking in either choice, quality or basic hygiene in one of them. After a small dummy spit about the state of the world and its takeaway choices I opted to go to the supermarket and get something from there. 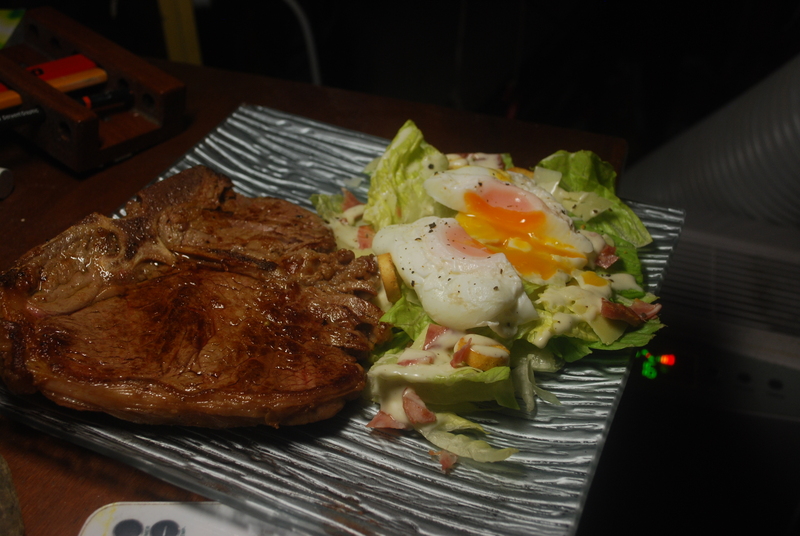 Easy, I got a cooked chicken from the deli and a prepared salad from the produce section and a nice ripe mango too. 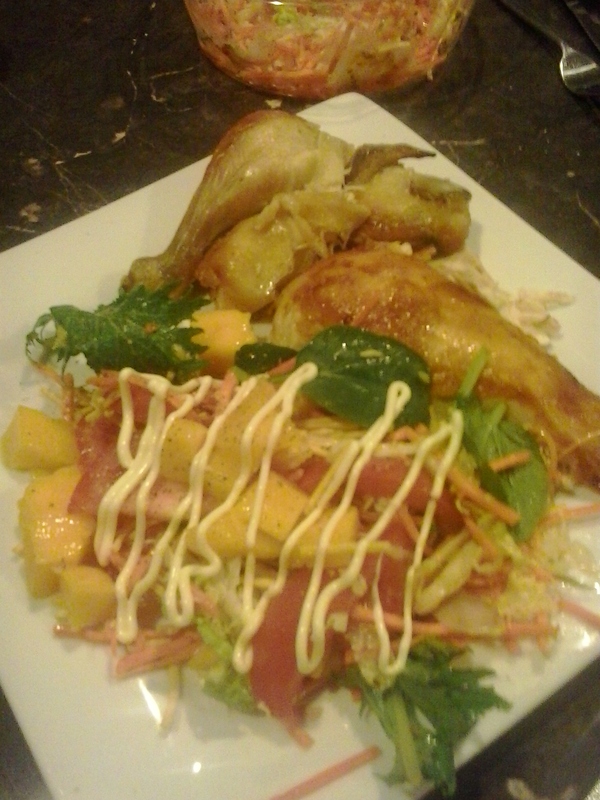 Chop the mango, add to salad and carve the chook. Prep time 15minutes including the buying and far better than many takeaway options. 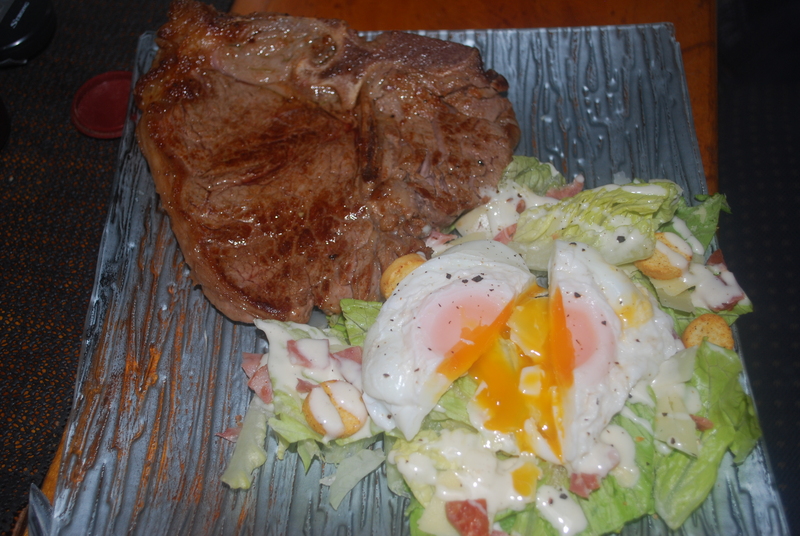 While this T-Bone was nice the star of the dish was the poached egg I cooked to go with the pretty ordinary shop bought Caesar Salad.Well done Egg, well done. This was going to be a green Paw Paw or Papaya Salad depending where you live. 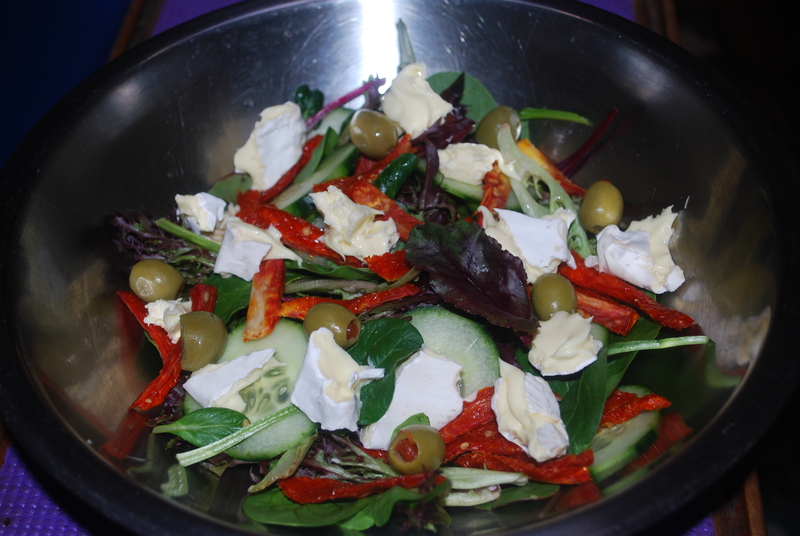 However I forgot about the fruit and it ripened more than I would have liked, so its a greellow paw paw salad. We used to have a Paw Paw tree at our back patio when we lived on land and they were fantastic paw paw. The tartness of the under ripe fruit goes really well with the Thai flavours of the dressing (when they are green) and the crunch of the sprouts combined with the heat of the ginger and chilli make it a great salad to freshen up a red meat dish. 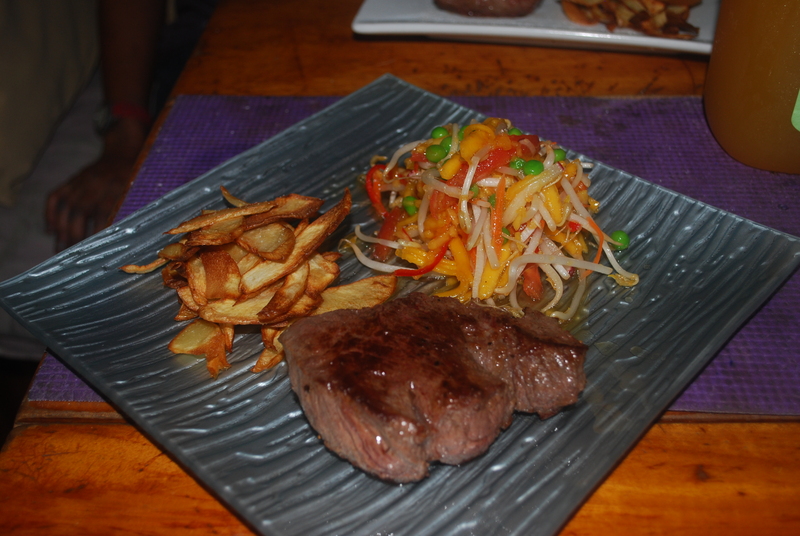 I made it to go with a nice little Eye Fillet and some Parsnip Chips. The dressing is a mix of soy sauce, fish sauce, lime juice, rice bran oil, S&P, honey, and a scige of sesame oil. Isn’t it strange how you forget about certain foods for ages and all of sudden you see someone else eating or making it or see it on Tv. That’s what happened with this Greek Salad. I watched someone making one on Tv and had to have one. Woohoo it was grocery day, didn’t have to make one of those impulse driving and shopping trips into town. I used baby coz lettuce leaves, blanched green beans, Lebanese cucumber, red onion, tomato, olives and baby spinach leaves and some really fresh Greek feta cheese. Oddly enough I forgot to get dressing ingredients but more oddly I had an unopened bottle of Greek salad dressing on board. 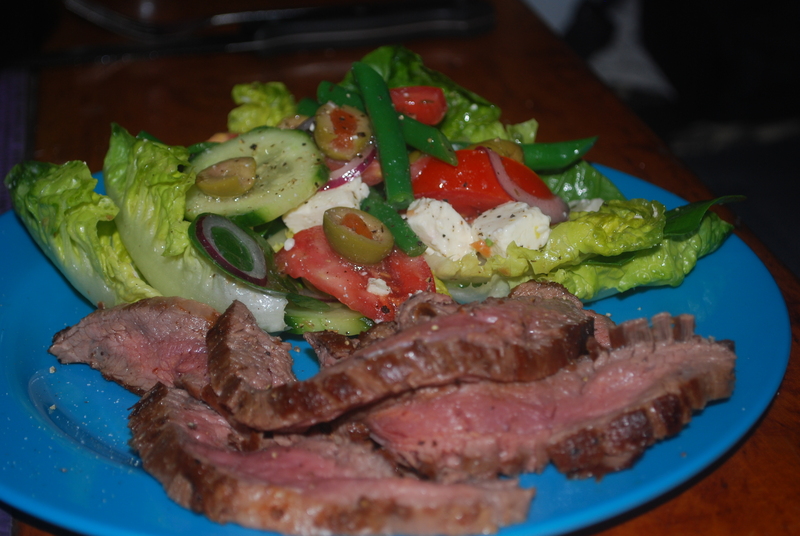 I got a nice Skirt Steak from the super market and had that in nice juicy pink strips. Half an hour or so go to whoa. 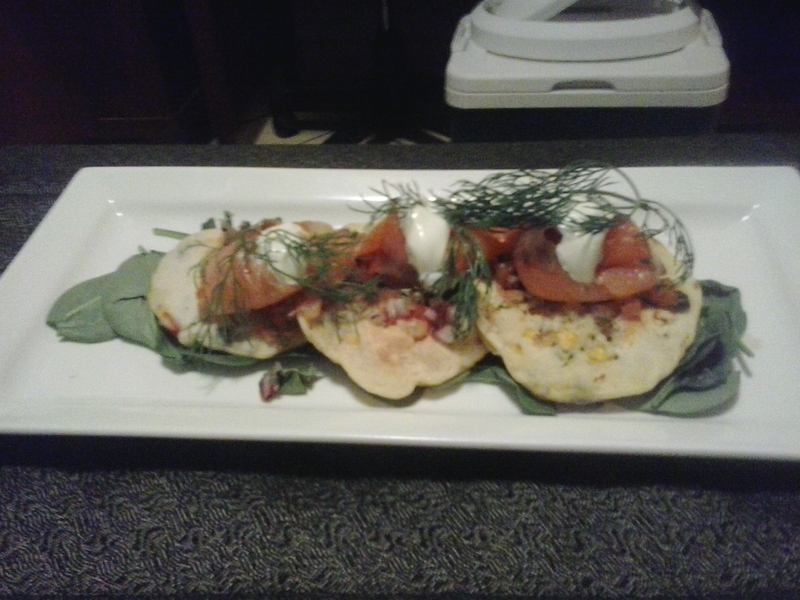 These pics pretty much reflect Paula’s and my different food philosophy. One is a nice salad with an excellent Tasmanian Triple Cream Brie the other is an Orange and Poppy Seed Cake w/ Cream Cheese Frosting. Have a guess which one I made and which one Paula made. 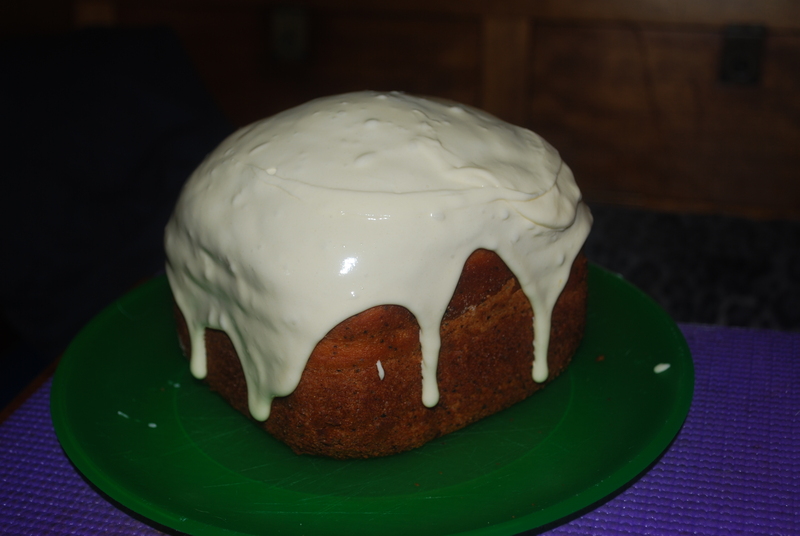 The cake was made in our mini bread maker, it makes great bread that size too, oh and Chocolate Fudge Brownies. I guess it shows there needs to be light and shade to keep the balance.